clean up just makes me realizes how much there is still to do. tonight i finished watching my so-called life and i watched the rest of the quarterlife episodes that i had not yet watched and then i took photos of my craft room/guest bedroom, which is the cleanest it's ever been and i put notes explaining what things were. cleaning up and organizing just made me realize how many projects i have just been sitting on. my to do list just grows and grows, but topping off the list are finally selling off these two boxes of sanrio stuff and some things i purchased as craft displays that i don't really need. also, i need to go through my books again as they are now spilling onto the floor. one project at a time. 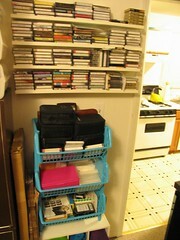 my goal is to find a place for everything in my craft room so that i can find something immediately and easily. oh, and not only are my cards now at pistol bazaar, 3 designs (flaky croissant, b-side to your a-side, best boo) along with doodleigh tags are now at renegade handmade hanging out in good company. :) after dropping the stuff off at RH (i can't abbreviate it like that because RH will always mean radiohead), i went to dinner at jerry's with miss alison. i am really going to miss her when she moves back out to cali. yay about the RWT cards. and YAY to jerrys. and booooo to miss allison moving to cali. i love her stuff. and yay on the craftysales! whee! Ooooo love the cleaned up room! i need to do this BAAAD! !